One nice thing about blogging is the feedback from the readers. I got some nice kudos, but also great new ideas. One idea was born out of a question about a "graphi" UI for the GraphQL Middleware I wrote some months ago. I never heard about "graphi", which actually is "GraphiQL", a generic HTML UI over a GraphQL endpoint. It seemed to be something like a Swagger UI, but just for GraphQL. That sounds nice and I did some research about that. Actually it is absolutely not the same as Swagger and not as detailed as Swagger, but it provides a simple and easy to use UI to play around with your GraphQL end-point. So you cannot really compare it. GraphiQL is a React component provided by the GraphQL creators, that can be used in your project. It basically provides an input area to write some GraphQL queries and a button to sent that query to your GrapgQL end-point. You'll than see the result or the error on the right side of the UI. A history of sent queries, which appears on the left side, if you press the history-button. To reuse previously used queries. It rewrites the URL to support linking to a specific query. It stores the query and the variables in the URL, to sent it to someone else, or to bookmark the query to test. The first idea was to write something like this by my own. But it should be the same as the existing GraphiQL UI. Why not using the existing implementation? Thanks to Steve Sanderson, we have the Node Services for ASP.NET Core. Why not running the existing GraphiQL implementation in a Middleware using the NodeServices? That works great, but has one problem. 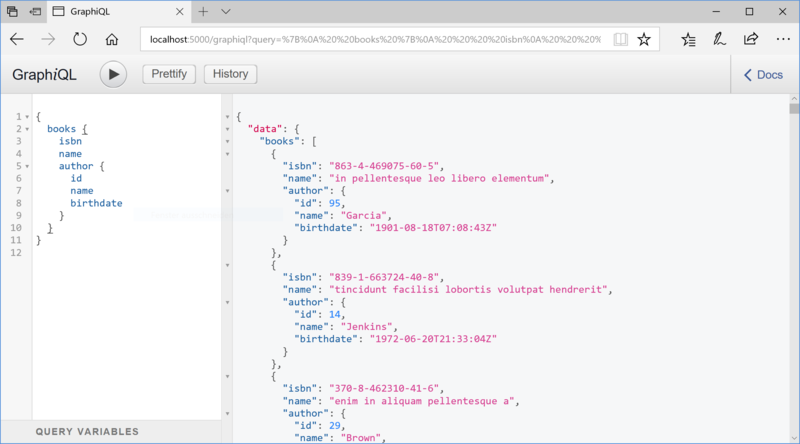 It wraps the GraphQL query in a JSON-Object that was posted to the GraphQL end-point. I would need to change the GraphQlMiddleware implementation, because of that. The current implementation expects the plain GraphQL query in the POST body. What is the most useful approach? Wrapping the GraphQL query in a JSON object or sending the plain query? Any Ideas? What do you use? Please tell me by dropping a comment. With this approach I'm pretty much dependent to the Apollo developers and need to change my implementation, whenever they change their implementations. This is why I decided to use the same concept of generating the UI as the "apollo-server-module-graphiql" package but implemented in C#. This unfortunately doesn't need the NodeServices anymore. I use exact the same generated code as this Node module, but changed the way the query is send to the server. Now the plain query will be sent to the server. I started playing around with this and added it to the existing project, mentioned here: GraphQL end-point Middleware for ASP.NET Core. As you can see the second Middleware is bound to the first one by using the same path "/graph". I didn't create any hidden dependency between the both Middlewares, to make it ease to use it in various combinations. Maybe you want to use the GraphiQL UI only in the Development or Staging environment as shown in this example. I'll create a separate NuGet package for the GraphiqlMiddleware. This will not have the GraphQlMiddleware as a dependency and could be used completely separate. I should add some more configuration options. E.g. to change the theme, as equal to the original Node implementation, to preload queries and results, etc. You wanna try it? Download, clone or fork the sources on GitHub. What do you think about that? Could this be useful to you? Please leave a comment and tell me about your opinion. This is really awesome. With GraphiQL I got a lot more stuff than expected. And it didn't take more than 5 hours to implement this middleware.